The easy-to-install, deck-driven Grasshopper PowerVac Collection System features a trash-ingesting steel impeller that chops and compacts virtually anything without clogging or bridging. Efficiently remove wet leaves and pine straw, collect grass clippings and remove debris left behind by storms. PowerVac propels debris material into the large-capacity collector, which is rear-mounted to maintain zero-turn maneuverability and maximum visibility. Tapered collectors compact debris for non-stop mowing and collection. 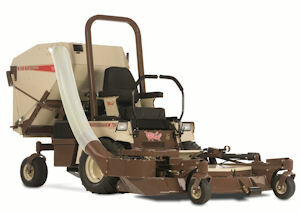 In addition, the PowerTilt collector empties from the operator’s seat at the touch of a switch.